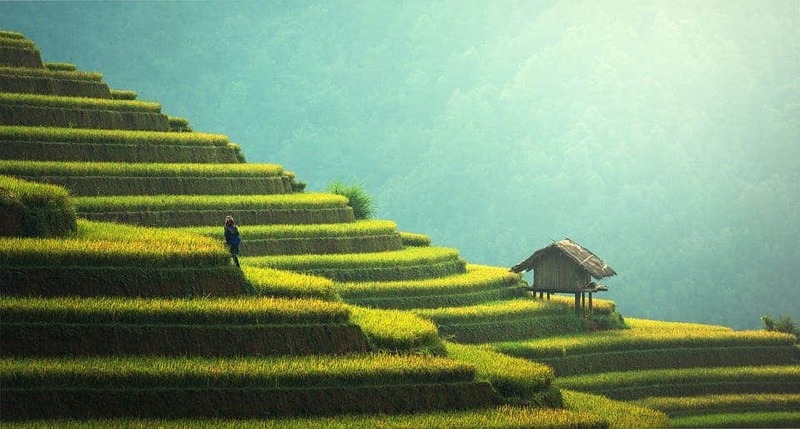 Increasing carbon dioxide levels in the atmosphere due to human activity are lowering the nutritional value of rice, according to a new study published in Science Advances. After wheat, rice is the second most important food crop in the developing world. Over two billion people in Asia and hundreds of millions in Africa and Latin America depend on rice for their daily calorie needs. It’s estimated that more than 40,000 varieties of cultivated rice (the grass species Oryza sativa) exist. Rice is also an important source of protein and vitamins, which is why the latest findings by researchers at the University of Tokyo are so worrisome. Their experiments suggest that rising CO2 levels in the atmosphere are lowing the nutritional value of rice, specifically iron, zinc, protein, and vitamins B1, B2, B5, and B9. 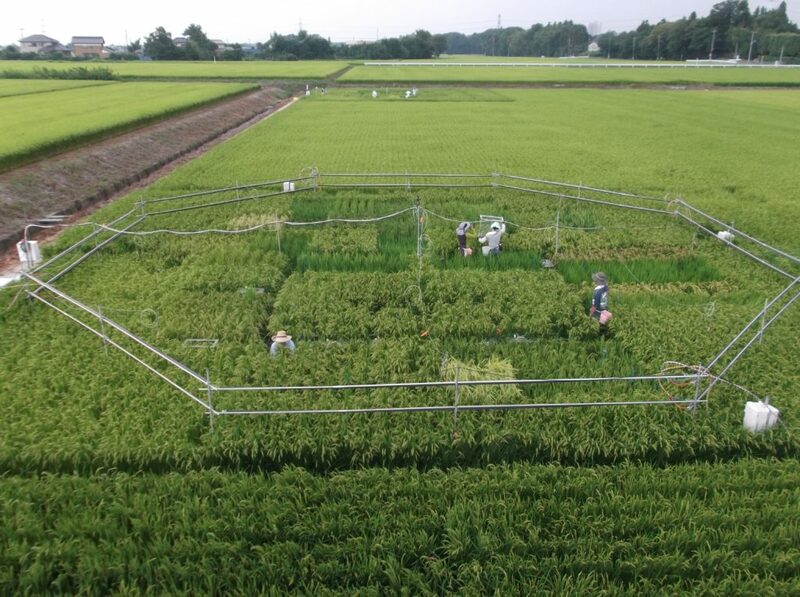 The team grew rice at sites in China and Japan using an open-field method called FACE (free-air CO2 enrichment). Professor Kazuhiko Kobayashi and colleagues at the University of Tokyo decided to grow the rice in an open field because plants raised in a closed greenhouse do not grow as they would in normal field conditions. Air with higher carbon dioxide concentrations, as expected in the second half of this century (568 to 590 parts per million), was blown through 17-meter-wide (56-foot-wide) plastic pipe octagons at about 30 centimeters (1 foot) above the tops of plants within standard rice fields. In total, the researchers analyzed 18 different varieties of rice for protein, iron, and zinc levels. Nine varieties of rice grown in China were used for the vitamin B1, B2, B5, and B9 analyses. Experimental rice field near Tsukuba, Japan.Dr. Toshihiro HASEGAWA (National Agriculture and Food Research Organization of Japan). The two FACE experiments have provided a unique opportunity to investigate how a crop fares in response to predictably elevated levels of CO2 in the atmosphere. But like with any other unique science experiment, the Japanese researchers had to overcome some challenges, including the presence of uninvited guests. “The unique experiments attracted other species. An example was raccoons in my own experience. We did the FACE experiment in farmer’s fields, where we installed plastic tubes to sample air from the field and measure CO2 concentrations in the experimental plots. Raccoons came out of the nearby mountains at night and tested the strength of their teeth against the plastic tubes. They eventually cut the air sampling tubes, which fell into the flooded water in the rice field jeopardizing our experiment. We then had to raise the tubes higher than their reach. The higher CO2 concentrations in the experimental plots also attracted blood-sucking insects, which we had to fight against while working in the plots,” Kobayashi told ZME Science. Little is known about the mechanisms responsible for the decline in nutrient concentrations associated with elevated CO2. Some authors have proposed “carbohydrate dilution” whereby CO2-stimulated carbohydrate production by plants dilutes the rest of the grain components, but studies so far have been inconclusive. What’s certain is that it’s happening. In many countries, rice is so important that they’re literally synonymous with food. The Chinese word for rice is the same as the word for food, in Thailand when you call your family to a meal you say, “eat rice”, and in Japan, the word for cooked rice is the same as the word for meal. The Japanese don’t consume as much rice as they used to during the 1960s, for instance, relying on only about 20 percent of their daily calorie intake from the crop. However, people in Bangladesh, Cambodia, Indonesia, Lao People’s Democratic Republic, Myanmar, Vietnam, and Madagascar who receive at least 50 percent of their calories and protein from rice are the most vulnerable to poorer nutritional content. Zinc deficiency is already linked to around 800,000 deaths among under-fives, in whom it can seriously exacerbate such conditions as diarrhea, pneumonia, and malaria, while iron deficiency is the main cause of anemia, a condition that contributes to around one in every five maternal deaths around the world. “Our finding has demonstrated another reason why we have to be concerned about the nutrition for the poorer fractions of the population in less developed countries. Any measures to improve their nutrition would effectively alleviate the negative effects of the lower nutrient content under higher CO2 level. The measures could be better policies and/ or better varieties, but must reach the target population,” Kobayashi wrote in an e-mail. As the world’s population continues to swell, not only will developing countries have to grow more rice and improve their yield, they will also have to find ways to offset the poorer nutritional value of the crops. Of course, rice won’t be alone. Previous studies have found that rising levels of carbon dioxide in the atmosphere reduce the nutritional value of other staple crops, such as wheat or soy. “This is one of the multitudes of challenges of climate change due to the energy production based on fossil fuel burning. We, in the so-called developed countries, take advantage of the fossil fuel energies, while having little troubles with the less nutritious grains, because we take the nutrients from other food stuffs. On the other hand, those in the less-developed countries depend grains for their nutrient intake, and would be affected by the changes in grain nutrient content. And, they are much less responsible for the climate change than we are on per person basis. This is really a shame on us, I think,” Kobayashi concluded. Scientific reference: C. Zhu, K. Kobayashi, I. Loladze, J. Zhu, Q. Jiang, X. Xu, G. Liu, S. Seneweera, K. L. Ebi, A. Drewnowski, N. Fukagawa, L. H. Ziska, Carbon dioxide (CO2) levels this century will alter the protein, micronutrients, and vitamin content of rice grains with potential health consequences for the poorest rice-dependent countries. Sci. Adv. 4, eaaq1012 (2018).